Standard & Poors released its December 2011 Case-Shiller Index this week. The report is the most widely-cited, private-sector metric for the housing market. The index aims to measures change in home prices from month-to-month, and from year-to-year, in select U.S. cities and nationwide. According to the report, between November and December 2011, home values fell within 18 of the Case-Shiller Index's 20 tracked markets; and through the 12 months leading up to December 2011, 19 of 20 tracked markets fell. Only Detroit posted year-over-year gains, adding 0.50% since December 2010. Now, these statistics may look dire for the housing market, but it's important to remember that the Case-Shiller Index -- though widely-cited -- remains a flawed statistic for everyday buyers and sellers in Bethesda. Rather, the monthly Case-Shiller Index is more appropriately applied by policy-makers and economists to macro-economic issues than by you and me for buy-or-sell decisions.. There are three ways in which Case-Shiller is flawed -- each tied to the way by which Case-Shiller Index is calculated. The first reason why the Case-Shiller Index is flawed is that, although it's purported to be a "national" housing index, the index tracks just 20 cities nationwide. The United States, by comparison, houses more than 3,100 municipalities. The Case-Shiller Index is not a representative sample of the U.S. housing market. And then, even within its tracked markets, Case-Shiller fails provide sufficient details to be useful. Within each Case-Shiller Index city, there are innumerable "local markets", each with its own local economy. 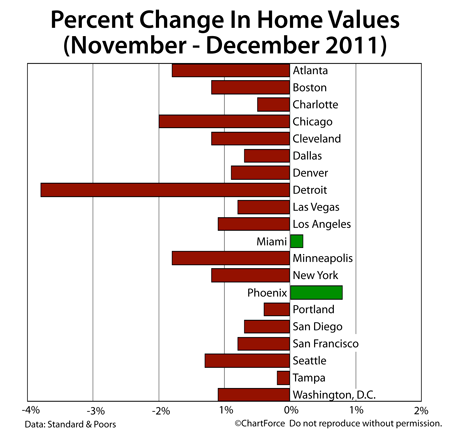 When home values are shown to be falling in Phoenix, for example, that doesn't mean that values are falling everywhere in Phoenix -- only in the aggregate. There are multiple neighborhoods in Phoenix in which home values improved in December. The Case-Shiller Index doesn't capture that. As another reason to ignore the Case-Shiller Index, note that the Case-Shiller Index only includes home sale data for single-family, detached homes -- sales of condominiums and of multi-unit homes are specifically excluded. In some markets -- Chicago and New York, for example -- sales of these types can represent a large percentage of overall monthly sales. Lastly, as a third reason to reduce the Case-Shiller Index's significance -- it's "old". The Case-Shiller Index is published on a 60-day delay and includes sales contracts from even 60 days prior to that. In other words, the data used in this week's Case-Shiller Index dates back to October 2011. Data from 5 months ago is of little relevance to buyers in VA today. Up-to-date and current information is what matters. For actionable, real-time housing market data, therefore, look past the Case-Shiller Index. Look to your local real estate agent instead.